Olymp Trade Review - What Is Inside? 1 Olymp Trade Review and Insights – What You Need To Know? 1.1 How Safe is it? 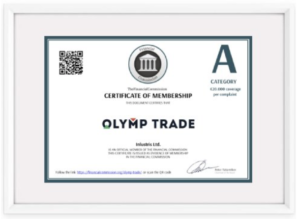 Olymp Trade Review and Insights – What You Need To Know? Olymp Trade is an online digital options broker from St. Vincent, operating since 2014. Since 2016, they are a member of the International Financial Commission. By becoming a Finacom member it is under Finacom supervisory. Finacom is a third party regulator guaranteeing security against fraudulent brokers. This gives Olymp Trade the trustworthiness needed to become an authority broker as you have to meet strict rules in order to be approved by this regulator. Recently it got a certificate, qualifying it as a quality broker by Verify My Trade, an independent audit body. The broker has also started to focus on developing markets in Asia and Latin America. This is a part of their new business plan, mainly because of the changes in the Russian trading laws. Being regulated by FinaCom, a regulation entity with a strict policy is definitely a good sign for the safety of the platform. Customers are offered up to $20,000 from the Compensation Fund, should their complaints be valid. Furthermore, OT settles their disputes through their client resolutions department and answers within 24 hours with directions on how the dispute will be settled. If you are not satisfied with the dispute results, you can file your complaint with FinaCom. Trading with a fully regulated broker is always the best option as the risk of losing money is minimal. The awards are a good indicator of Olymp Trade delivering great value to their customers while operating in a transparent and safe manner. Besides being a member of FinaCom, OT also offers a convenient demo account that comes with $10,000 in virtual money. This allows you to try trading risk-free and to learn without risking your own money. The demo account can always be recharged should your balance drop below $5,000. You can access the platform in three ways: through their website, their desktop application, available for Windows and macOS, or through the mobile app for both iOS and Android Smartphones. Should you open a real cash account, you can trade for as little as $1. You don’t have to risk much on a single trade if you don’t feel like it. One of the drawbacks we noticed is the number of assets on the platform. There are 77 financial instruments available. It might look like there is not enough of them, but for a beginner trader, it is more than enough. In the beginning, it is better to master a few of the instruments before trying out something new. That minimizes the risks of losing your money when mastering your craft. Having the proper tools is crucial when trading. It can be the whole difference between failure and success. 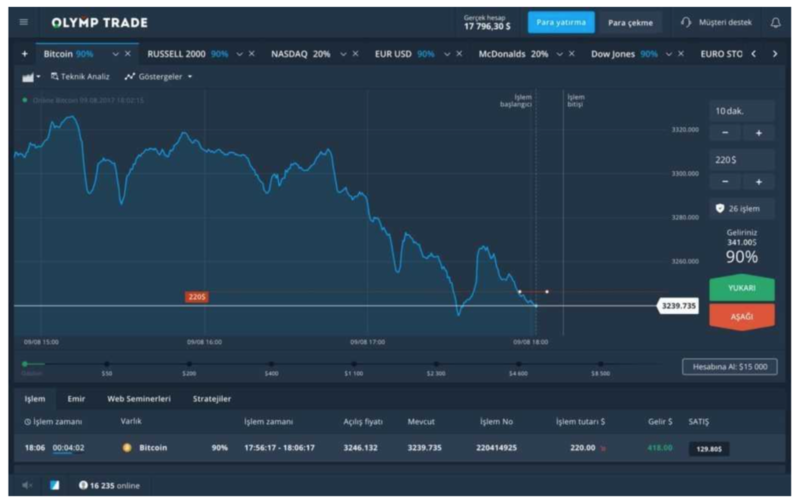 OT has a variety of tools that include over 20 indicators and 4 charts, easily accessible through the user interface and also supports social trading. The chart timeframe is chosen manually. You can choose between 15 seconds to 1 month. This gives you enough flexibility when tracking market prices over any period. One of the features we preferred was the assistant button that comes with every indicator. After you click it, it opens a pop-up button which directs you to all training materials and instructions on the specific indicator. Among other learning resources, they offer webinar access and interactive courses that teach how to trade with financial instruments. They update their webinar material on a daily basis which is quite impressive. All in all, it is a very beginner-friendly platform. You can choose between a regular account and a VIP account. The VIP account allows you to get some extra bonuses like a personal trading guide and daily market reviews. You also get faster withdrawal times. The VIP withdrawal usually takes under a day. One of the features we preferredwas the assistantbutton that comes with every indicator. After you click it, it opens a pop-up button which directs you to all training materials and instructions on the specific indicator. Among other learning resources,they offer webinar access and interactive courses that teach how to trade with financial instruments. All in all,it is a very beginner-friendly platform. When you make an account with this platform you are offered a starting bonus (you can also refuse it). They offer an effective return as high as 82% for regular members and 92% for VIP members. Traders also have a chance to gain extra money by participating in contests and many other special offers. Right now, there are 77 assets to choose from. This is a good thing if you don’t want to be overwhelmed with options. They offer Forex, cryptocurrencies, commodities, shares and stock indices. The assets are easy to find due to a special button at the top of the trading interface. Another convenient feature is the ability to choose an entire group of assets. For example, if you prefer trading Bitcoin, you can use the selector feature to trade only cryptocurrencies. This is very useful if you want to check the price movements in a certain asset class before making your move. With OT you have one type of trade: call/put digital options. This could be a drawback for someone who is an experienced trader. On the upside, the call/put option makes it easier to predict a trade as well as making it easier to exit from a losing position. The platform is offering a lot of different short term trades. In a short trade, traders can be in a position from 15 seconds to an hour. You have more flexibility as you can put in the exact time you want to be in a position as opposed to choosing from preset choices. This means you can decide how long trade should last. Another perk is being able to cancel a losing trade at will, reducing your losses. You can make a trade in two ways: First, you can place an order to buy the asset when it reaches a certain price. Example: you anticipate the price will drop and put in an order to buy an asset at the lower price. Secondly, you can put in a time limit order. If you think the asset will be cheap in the next 15 minutes you can order to buy it in that timeframe. 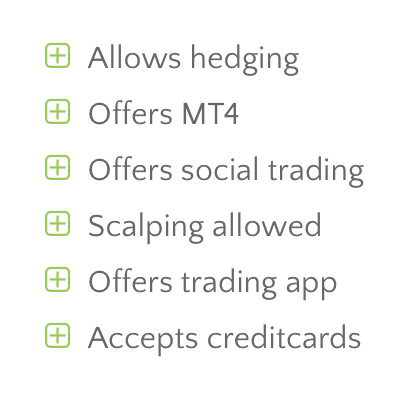 When trading, the broker doesn’t charge fees on placed trades or withdrawals. Their effective return is up to 82% for regular traders and up to 92% for VIP members. You can also cancel a trade inside the expiry period. The trading interface is well designed and it’s easy to navigate. 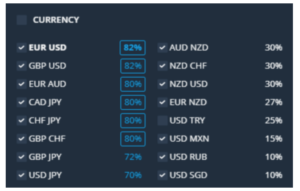 The layout is very intuitive and if you want more of the technical indicators you can access them through a »technical analysis« button on your trading interface. Originally, the OT worked only with Russian traders and a few Asian countries. Now they have expanded their service to countries from the Middle East, North Africa, Latin America, and Asia. They cannot accept traders from the US and some European countries. The platform supports English, Russian, Indonesian and Thai among other languages. The minimal deposit for standard accounts is $10, and $2,000 for the VIP accounts. Those requirements are quite low, compared with other brokers. You can deposit funds via wire transfer, credit card or e-wallet. Withdrawals can be made through the same channels. Each withdrawal request is processed within 24 hours. However, it might take up to 5 business days for you to receive your money, it all depends on the payment method. All in all, it is a trustworthy platform as it is regulated by FinaCom and comes with a Verify My Trade audit. It also has a lot of interactive learning material. The interface is user-friendly, the design is clean and very intuitive. 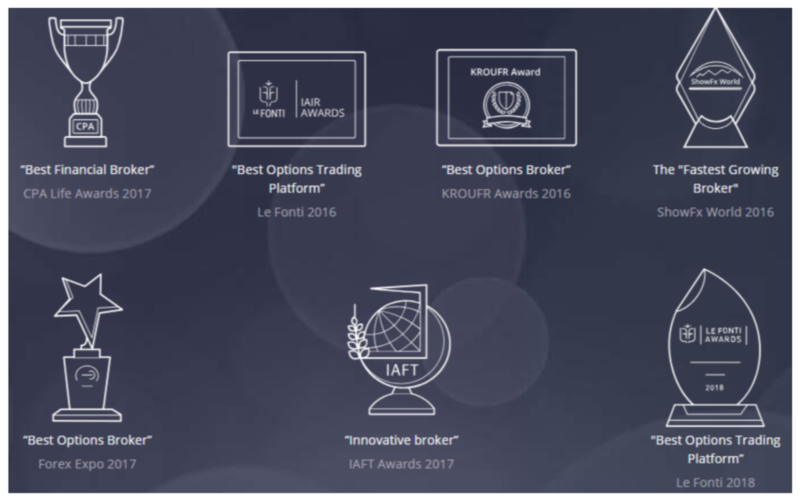 The broker has a lot of awards, and many positive reviews from traders, on the platform. Overall we would recommend it, especially if you are a trading beginner.